Hey Hey!! Hope y’all are having a good week!! I’m headed to Haven tomorrow and I am BEYOND EXCITED. And more than a little nervous. This is way out of my comfort zone but sometimes you have to push yourself, that’s where the magic is right? 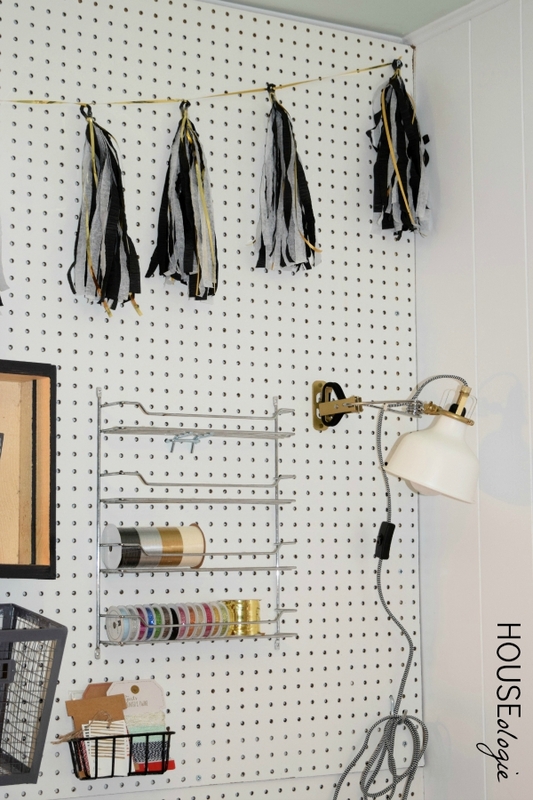 This past weekend I decided to add a little fun to my Craft/Work Space with this Black + White + Gold Tassel Banner. It adds just the right amount of glam and whimsy. I love it!! Plus you get to see the direction the craft room is going in!! Pegboard organization for the win!! 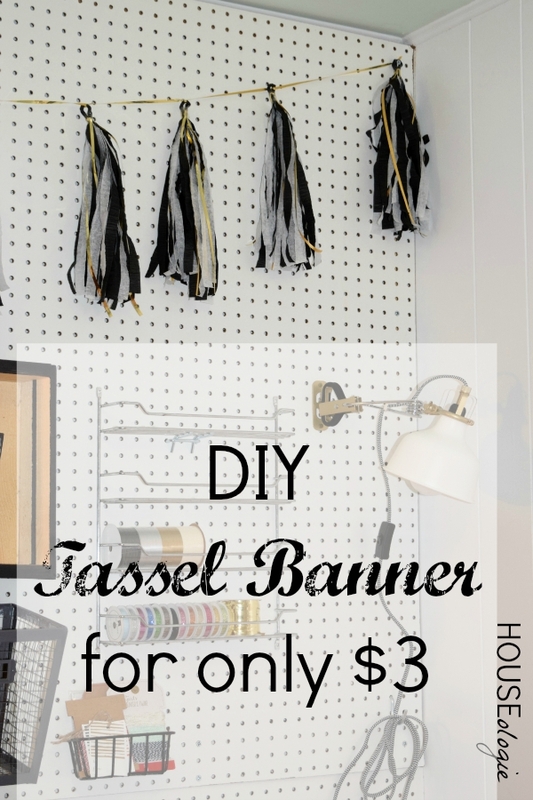 I made this tassel banner for less than $3 so I thought I’d show you all how to make one too!! 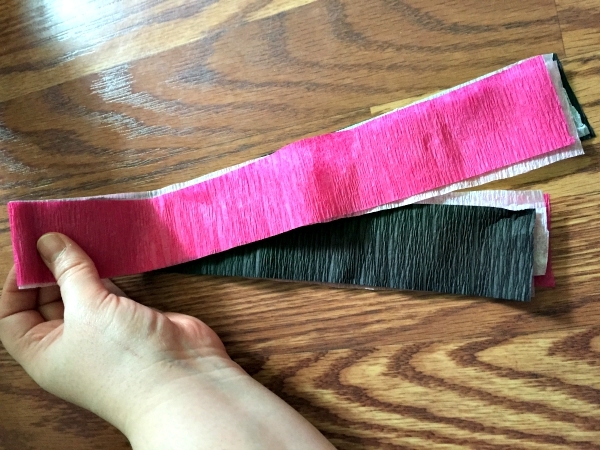 Most tutorials you see for tassel banners use tissue paper, which I found to be way too delicate and frustrating to work with. 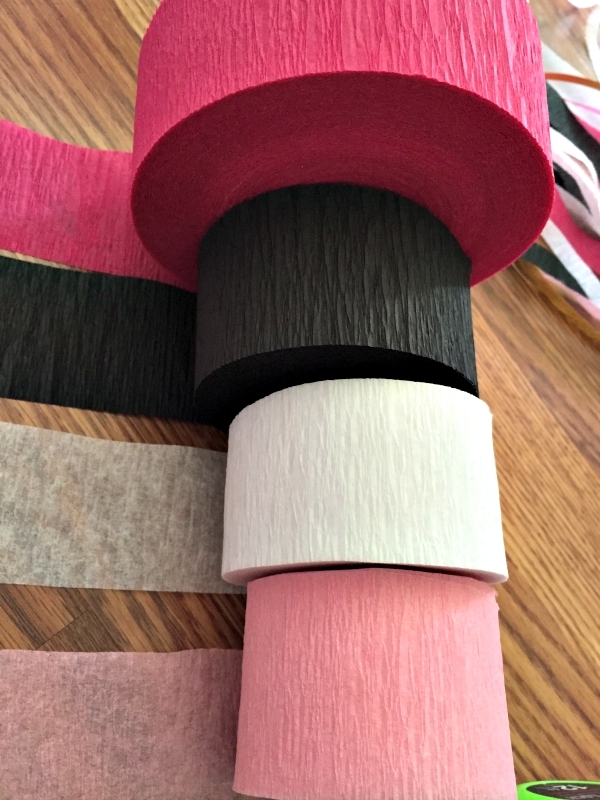 I decided to buy rolls of white and black streamer at the Dollar Tree ( for $2 you get 4 rolls!) I also bought a $1 roll of shiny gold ribbon. 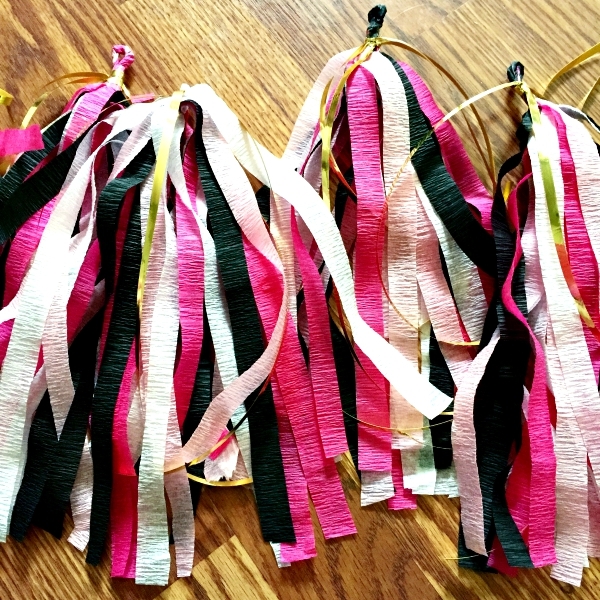 I made 12 tassels and tied them all onto one string with a little knot so they would stay in place. 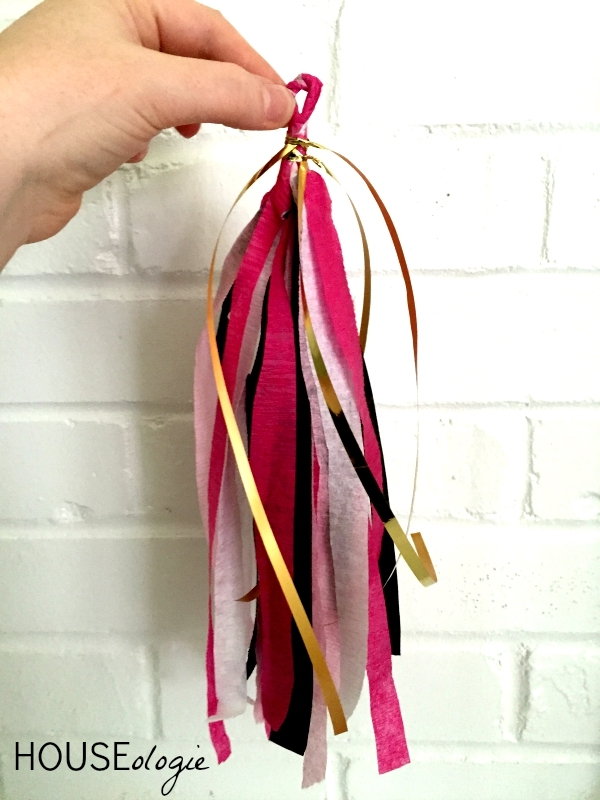 Gather all of your supplies and get comfy because making 12 of these tassels is going to take about an hour or two. Turn on your favorite Netflix and binge while you work. For the purposes of this tutorial you will see different colors than my craft room banner because I took pictures for this tutorial while making a banner for my 13 year olds birthday party. First pull your measuring tape out to a little past two feet, sit it on a flat surface and lock it. 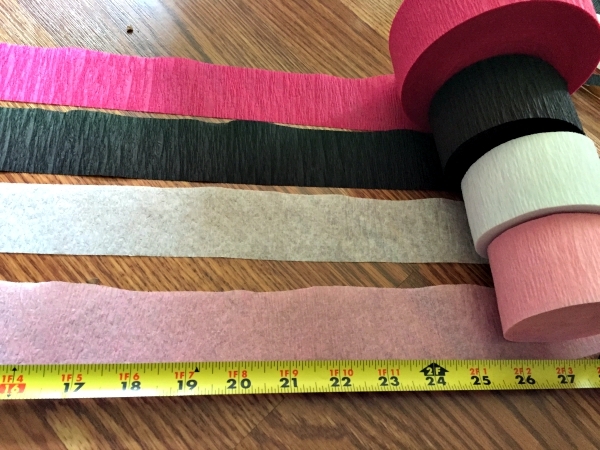 Start unrolling your streamer paper out and measuring to 2ft then cut. 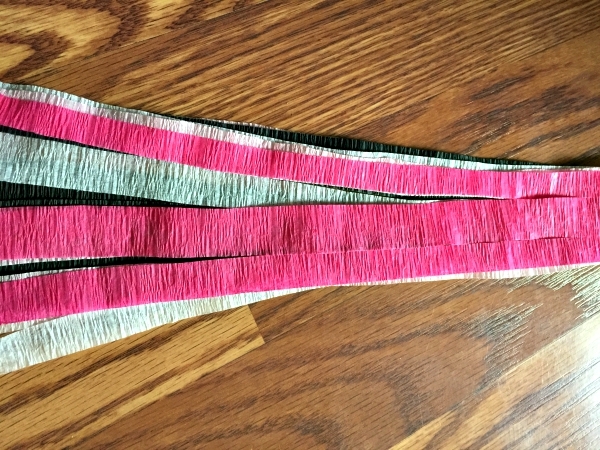 I cut 4 strips of each color. So in the end for one banner you will have 8 strips. Stack the strips alternating colors. 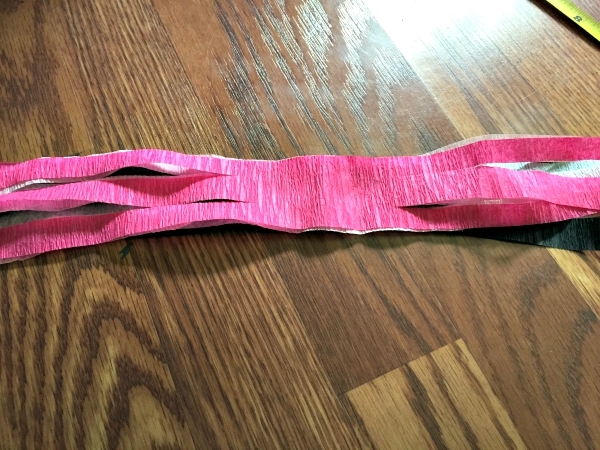 Fold the stack of streamers in half and have your helper hold it down or clip your binder clip on the end. Grab your scissors and cut three strips up the paper. Unclip, unfold and lay flat.Take the middle uncut portion and fold each side to the middle then twist, twist, twist. 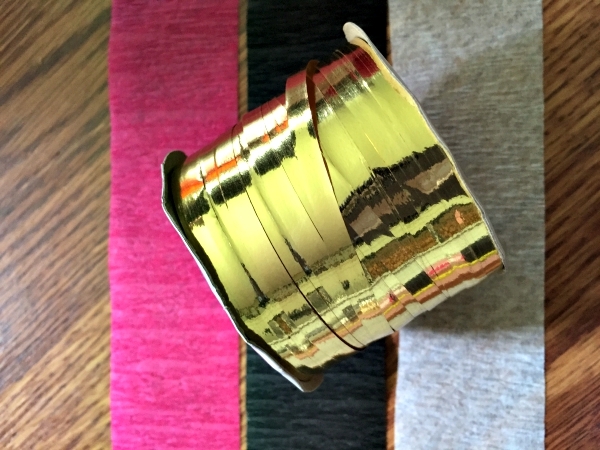 Next I added in the metallic gold ribbon by cutting and measuring it to the same length as the streamers, then tying it onto the twisted part of the streamer. Fold in half and use a little clear tape to secure. Voila! You finished your first tassel! So easy, right? I love that it added some fun and some texture to this white room. I’m loving this space and can’t wait to show y’all more of the progress next week!! I like this method WAY better than the ones that use tissue paper!